This is an appeal to any collectors, dealers, historians or anybody else who can help us to complete the full list of makers and their marks. 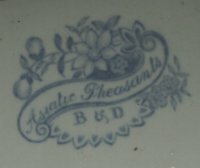 Several collectors have sent in descriptions of the marks on their Asiatic Pheasants wares and we have been unable to identify the makers. 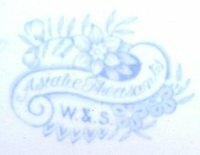 We welcome help identifying makers and more photographs of makers or backstamps not yet represented. If you can help at all please E-Mail us. 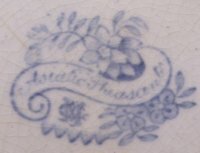 We are also looking for photographs or scanned images of the cartouche or backstamp for the following makers to help complete our online resource for collectors . The following are the list of marks that we need. BURSLEM Allman, Broughton & Co.